Easter is just around the corner. I have friends that love Easter just about as much as they love Christmas. I am the polar opposite. I respect, enjoy and celebrate the religious meaning of Easter and all that it symbolizes… but I truly could do without the expensive Easter baskets full of sugary treats, the plastic toys (that only end up getting stepped on), the green Easter basket grass that can’t be vacuumed up (yet clings to everything) and the one random, colored egg that isn’t found until you open the fireplace for its seasonal debut. Oh, and did I mention that I abhor all of the decorating with pastel colors? Maybe it’s a reflection of my bold, outgoing personality but I love rich colors… pastels, not so much. That’s hilarious! I can totally visualize it!!! My son’s first photo with That Rabbit was perfection. He was tiny, so it was easy. His first photo with Santa (not quite one year old) could have been used in their adverts, it was so beautiful. Naturally, I thought my kid had this DOWN, right? 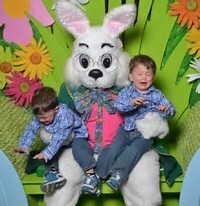 So the next year, I plunked him on the wabbit’s lap (same one, by the way, even the same sweaty actor) and… my baby boy screwed up his face, opened his mouth wide, and made a noise that caused the photographer to ask me to leave. I still have the photo, of course. They gave it to me gratis, for taking him away.